Catherine was our model search winner last year–and she’s one exuberant lady, which shows through in our photos this month. We’ve taken casual and put it to new fashion heights here. 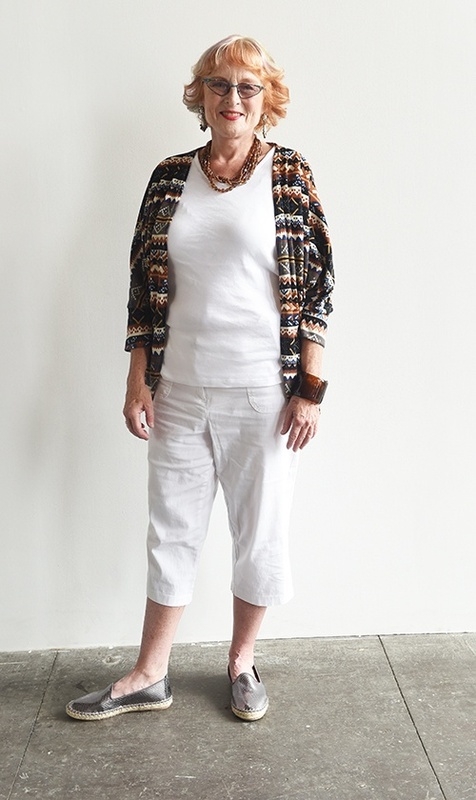 As an avid Goodwill shopper, Catherine brought some of her own items to the photo shoot, such as these off-white capri pants and a simple white t-shirt. What I did was add the fashion with key pieces and accessories. This patterned cardigan made of lightweight cotton from Forever 21 is the perfect item to elevate the basic items we started with, plus at $4.99 it’s a great bargain! I also found some cool espadrille flats in a soft metallic silver by DV that were just $4.99. The look is still casual but stylish, right? The enormous brown faux-tortoiseshell cuff, bronze earrings and beaded necklace just layer on the charm as well. She is ready for a special day of shopping, or a fun summer festival in this amazing look! Rose was also one of our model search runner-ups last year, and she had already purchased this fun dress on one of her Goodwill shopping excursions. It’s bright and fun just like she is! 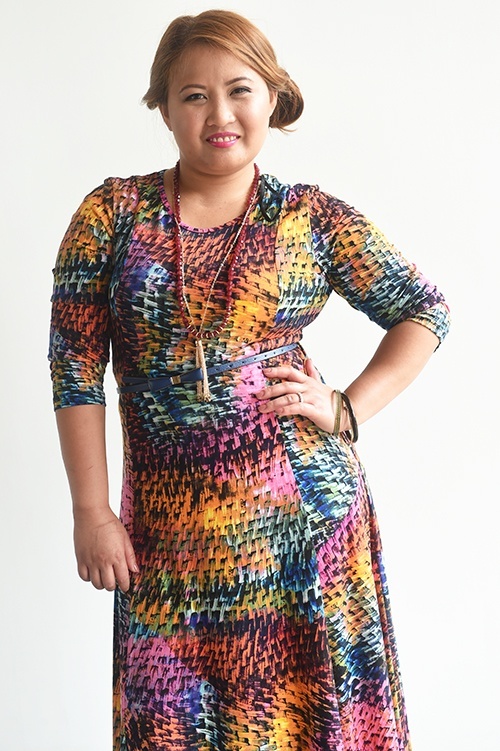 This multi-color statement print dress by Nina Leonard was just $5.99! I couldn’t resist adding lots of fun accessories like the faux-fur vest in cream that was $15.99, and the fabulous maroon hat I found for $2.99. To literally elevate the petite model, we added the platform wedge clogs from Mossimo in black, which were $6.99. Accessories such as the skinny blue belt ($1.99), tassel necklace ($6.99) and bracelets for $1.99 each add just a little more movement to this crazy quilt of fashion. Rose not only pulled off this look but she owns it!